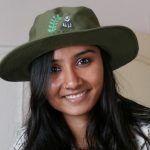 Priyanka has always been passionate about wildlife and has worked in different aspects of wildlife conservation including publications, field research, education and policy. She found her true calling at Zoo Outreach Organisation, where she is a researcher working on projects concerning threatened species, freshwater policies, and illegal wildlife trade. She also works on the peer-reviewed, open access Journal of Threatened Taxa as an associate editor.